I learned to ride on a Honda Rebel, but my balance has never been good and is getting worse as I get older. I moved to a Honda Goldwing Trike, and as much as I loved it, it still was not quite me. 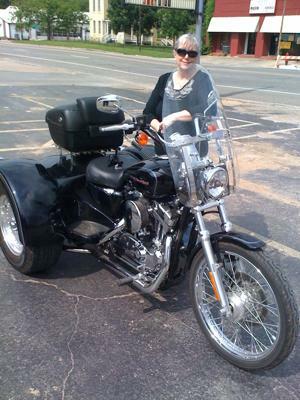 I finally have found the bike-love of my life - my 2005 Harley Davidson Sportster Trike. I may not be able to ride too many more years, but I'm going to enjoy the time I have left to ride!! !